This page is intended to educate our customers about Surface Solutions’ PVD coating process. By better understanding the coating process, customers should be able to make better decisions in the choice of substrate material, heat treat temperatures, machining methods, assembly methods, etc., and develop a better appreciation of how coatings can benefit their organization. 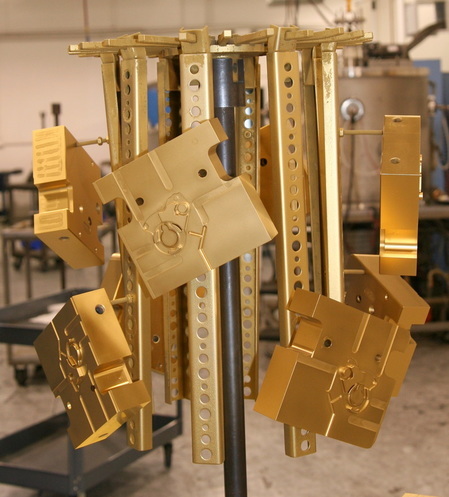 Surface Solutions uses a cathodic arc vacuum coating process to coat parts. Compared to other vacuum metal coating processes (sputtering, e-beam evaporation, etc.) cathodic arc processes have a higher degree of metal ionization, which results in exceptional coating adhesion and a robust coating process. Order Entry, Receipt of Tools – you send us your parts and we price them out and enter the order. Your parts are grouped with parts from other customers to make a batch. Typical lead-times for coating are a week, or less. Cleaning – parts are sent through a cleaning line to remove surface contaminants. Fixturing – parts are placed on fixtures so the important areas of each part are positioned inside the vacuum chamber to be in a direct line-of-sight with a vapor source (evaporator). Coating process – parts are placed in the vacuum chamber, the chamber is pumped and the parts are coated. The coating is applied at about 800°F. Inspection and shipping – coated parts are inspected, packaged and shipped back to the customer. * – Some of these processes are performed by outside vendors. Not all Coatings are the Same!